In my experience both working in the wild west of tech for 20 years (where I still “make my job”) and as a leadership coach for some amazing people who usually work in tech, this is 100% the case. You can “make” the job that you already have so that you do more of what you love, less of what you don’t love, and ultimately make the kind of impact and difference that you want to make at work…and in life. When I talk about “owning” your story at work and in life, this is what I’m talking about: Pave your cowpath(s). It all starts with first finding that cowpath. It might sound daunting, but rearchitecting and reengineering your work life is doable when you put your design thinking, lean, and agile brain to work. Step outside yourself. Look at your work life, your life life. Buzzwords aside, the gist is: What’s working? Do more of that. First, write out what makes you tick as a list, as mentioned in the above article. Or you can map it out as a story. Once you have it out on paper, consider this your blueprint. You can use it to figure out how to do more of what you love in your life. If you’re stuck, think back to past experiences—at work or in life—where you were doing things that excited you. Where were you? What were you doing? Where did you struggle? Where did you excel? What values drove you? What value did you provide? All of that is a story—your story. Write it down. If you’re really stuck, ask friends and family to tell you what they think you’re great at. Your answers might surprise you. Or the might not. Either way, you’ll start getting an idea of what your story is…and can be. Once you’ve got an idea of what your story is, ask yourself: how can you do more of this? Whatever your answers are, those are hypotheses that you can test. Now is when the fun begins. You can start running experiments to get data. Are your hypotheses true? Which scare you the most or are the riskiest to not have answers to or data for? Test those first. Let me repeat: Test. Your. Scariest. And. Riskiest. Hypotheses. First. If you're on the right track, keep going. If not, adjust. If you keep doing this long enough, you’ll get on the right track and start making things happen. The sooner you can do this, the better. So how do you do this all in practice? The good news is that if you work in tech or are familiar with fancy pants things like design thinking, agile, or lean, you already know how to do this. And for the rest of you, you can easily learn some rules of thumb. Think BIG by setting quarterly and annual goals of where you want to be and success metrics for how you’ll know you’re there. And think small by running tiny experiments to make sure you're on the right track as you build your life. You think you want to do X? Prototype it today so that your experiments are as effective as they can be. How do you prototype your life? The same way you do a product or service. Start with your lowest fidelity prototypes. In the room. Write, sketch, role-play. Those are fast, cheap, and disposable ways to prototype an idea. Let me repeat: In the room. Right now. Alone or with a human. On paper, on a wall, with your body, whatever. Your goal here is to collect data as quickly as possible with the least amount of work. Data, in this case = thoughts, emotions, physical feelings, not spreadsheets. You'll learn a lot. Do you love spreadsheets? I love spreadsheets. Put them away. Close those tabs. Now is not the time for spreadsheets. Travesty, I know. As you experiment, you can get higher fidelity as you get out of the building and start putting your ideas out into the wild. When you're ready, get out of the building. Scope a larger experiment for 2 weeks—not longer—so that you can avoid lengthy rabbit holes. How does it feel? What did you learn? Collect more data. If you're on the right track, great! And if you're not on the right track, adjust and pivot quickly and as necessary. If it helps, consider these experiments and not tests. The goal is not to try/fail. The goal is to learn. What you'll see in thinking and working this way with your life is that your dreams (and your fears) are not as out of reach or daunting as they seem. You don't have to wait months, years, or even decades to figure out how to be more super at work and in life. You can do it now. The trick is to think of your experiments and the things you learn not as trying / failing, but as data / learning. You can’t fail when you’re learning. You learn. Or you don’t. It’s as simple as that. Working iteratively will give you quicker wins, better data, and momentum along your journey. Heroes don’t set out on a journey, try something, and meet their goal right away. They try something. They learn something and probably get something. They try something else. They keep learning and getting little things…so on and so forth. Eventually, they learn and grow enough that they’re able to successfully slay that dragon or reach that pot gold or whatever it is they’re trying to do. It's how good stories and adventure tales work. It's how your brain wants to work. And it's probably already (in theory) similar to the way you already work (or want to work). The other trick is to reward yourself as you progress along your journey. Your brain will thank you (and be more motivated to keep going). Goals and rewards make successful stories work. And goals and rewards help successful people do amazing work. What’s your story? What do you want it to be? Hi, I'm Donna. I’m a leadership coach, speaker, and author. 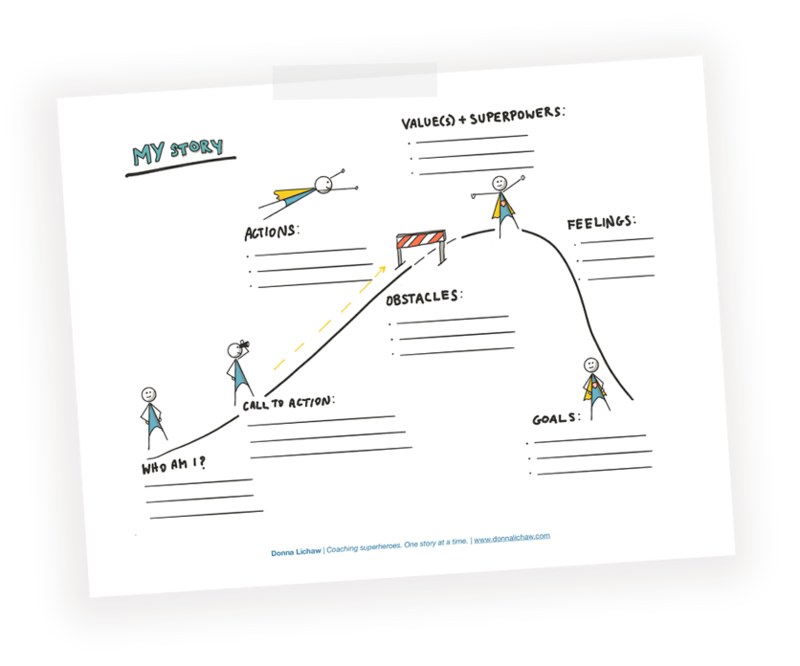 I help leaders in tech and tech adjacent fields unlock their superpowers so that they can get unstuck, level up, lead more effectively, and make an impact at work and in life. Do you want to be more super at work? Let’s chat.